We are 29 households aged from baby to 80+ years. We work from home, commute, and are retired. We attend public, private and home-school. We own our homes and rent. We value sustainability, community, farming, re;ationships and living lightly on the earth. A single-family home in our neighborhood is LEED Platinum certified (US Green Building Council); All of the buildings are constructed to the same rigorous environmental standards and use less than half the energy of typical houses. Our architect-designed, New England farmhouse-style homes have front porches and are sided with red cedar shingles. Each home is super-insulated with triple-glazed windows, infrastructure for solar hot-water collectors, and natural, nontoxic materials chosen for quality and durability. The entire neighborhood is heated by a central wood-pellet fired heat plant. Hardwood and tile floors are used throughout the homes; the interiors are light, airy, and spacious. Single-family and Duplex units have first floors featuring a kitchen and open-concept living/dining room with a full mudroom entry and half bath/laundry room. Single family homes have a first floor master bedroom and full bath. Duplex second floors have a master bedroom, full bath, and additional bedroom(s). First floor quad units have open concept kitchen/dining/living room and large bedroom and sunroom. Upper quad units have main level open concept kitchen/dining/living room and 3/4 bath and bedroom/office, and master bedroom and full bath on upstairs level. Private living spaces have views of woods, farm fields, or the river. We are a pedestrian-friendly neighborhood, with vehicles limited to the parking area at the periphery. Our farm includes fields for pasture, hay, vegetables, and fruits. There is also an apiary, layer chickens, pigs (seasonally), horses and occasional cows. Peterborough is a quintessential New England town located in a nature-lover’s region of mountains, ponds, rivers, and picturesque villages. 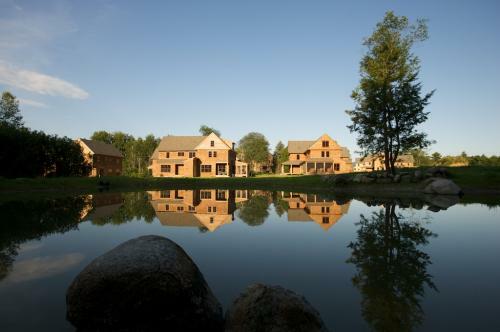 Our town is a vibrant arts and cultural center, and is home to the world-renowned MacDowell Artists Colony. We have good public schools, as well as Waldorf and other private daycare, preschool, elementary, and high schools. Recent events, photos and videos from the neighborhood.